For those of you who may want the high-mountain scenery, camping, and unlimited riding of a Cattle Drive, but not necessarily the cattle, you’ll want to join one of our exotic horseback riding trails. 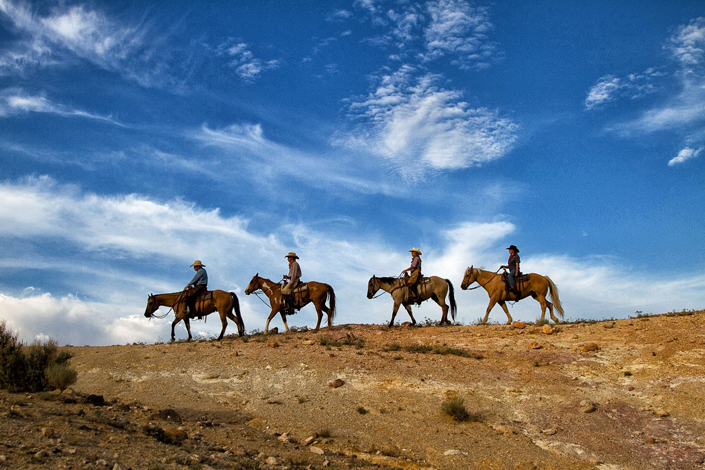 You can go horseback riding on the same trails Butch Cassidy rode and explore a natural paradise. We offer an excellent opportunity to experience the beauty of Southern Utah–filled with wildflowers and wildlife as varied as that of any state in the nation. If you like to fish, there are several lakes to choose from. But don’t forget to bring your camera and lots of film. You’ll camp in tents (or under the stars, if you prefer) at our Cow Camp and savor meals cooked over an open fire or camp stove. Each day you’ll venture out with horse into new “territory”. If you start out as a “beginner“, you’ll end up as an “experienced” horseback rider. We will be happy to organize your own Exotic Mountain Trail Ride on any date with groups of five or more people. Please contact us with details of the size of your group and time frame requested. Check in time is between 4:00 and 6:00 p.m. the first night. After a hearty dinner at the lodge, you’ll sleep in one of our comfortable rooms. The next nights will be spent camping on the mountain. On the morning of the last day, you’ll return to the lodge where you can enjoy a hot shower before heading home. If you prefer, you can also spend a day or more at the Dude Ranch before or after your scheduled mountain trail ride and participate in the other activities we offer.